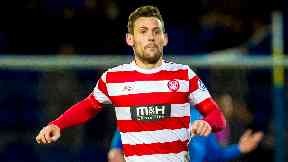 The French midfielder has signed to boost Accies hopes of beating the drop. Hamilton have completed the signing of former fans' favourite Tony Andreu on loan from Coventry City. The French midfielder starred for Accies from 2013 to 2015, playing an instrumental role in promotion to the top flight, and will now look to give Martin Canning's side a boost as they head into the second half of the season. Canning told the club's website: ''Naturally we're delighted to bring Tony back to the club. It's a signing that will give everyone around the place a real lift. ''We wanted to add quality at the top end of the pitch and we know Tony has that. "I obviously know him well and I'm looking forward to working with him again. "He's a top professional with a great attitude and he's only going to drive up the standard amongst the group in training and in games. ''We know we need players who can contribute straight away and that's what we're adding. Andreu left Accies for Norwich City in 2015 but failed to make an impact in Norfolk and had loan spells at Rotherham United and Dundee United. He moved to Coventry City in 2017 but suffered a cruciate ligament injury that left him on the sidelines long-term.